Lori grew up in Henry, Illinois. 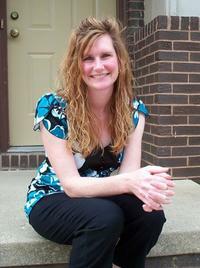 She and her husband Dan have three school-age children: Mitch, Nick and Colby. As a teen I knew that I wanted the opportunity to work with kids. I became a teacher and started off teaching 6th grade and then moved to 2nd grade. When it came time for my husband, Dan, and I to have kids of our own, I chose to stay-at-home full time. Our 3 kids are much older now and I have been employed by MUMC for over 12 years. My favorite part of working with the youth is the chance to see students find their gifts and figure out how they can use those gifts serving God in ways that they love. If you had 2 weeks of vacation, how would you spend the time? The Carlson motorhome rambles down the road pretty much anywhere we can go. Most recently the entire family took a month to drive to Alaska in the motorhome, which was the adventure of all adventures. Two weeks could definitely get us to Maine and back. If were preparing to go to a deserted island, what would you request for your “last meal?” I am a real planner, so first I would make sure that there wasn’t a mix up in my reservations. I am sure I would have asked for the “desserted island.” Upon confirmation that it was indeed going to be a deserted island, I would start packing the camper with chocolate pie, key lime pie, brownies and can’t leave alone bars. Then I would remind my hubby that the camper will need to float and that he should get right on that. I have no intentions of going alone, nor having a last meal. How have you seen God at work lately? It quite common for me to be pondering over a situation, whether it be a home struggle or a work struggle, only to have some wisdom pop up on my You version app in a daily devotion. Lately, though, I have watched God place people directly in the path of others who need them at that time----a person who needs a skill is connected to one who does that very thing for a living. What is your favorite season of the year and what family activities do you enjoy during that season? For the first 8 years of our marriage Dan and I lived in Daytona Beach, Florida. I had no idea how much I would miss the changing of the seasons until we didn’t experience the drastic changes from one to another. I have always loved fall as it is back-to-school, harvest, bonfires, apple picking and a time to truly enjoy the land before winter arrives.